1. 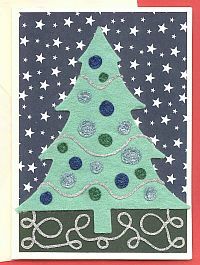 Adhere your scrolled Mary Engelbreit paper toyour card. Cut a .5" x 3.5" strip of your Treasure Tape Sheet, andapply it across the center of your scrolled paper. Press outward from the centerto remove any air pockets. 2. Peel back the red liner and begin laying downrows of thread. You can alternate between ribbon and braid for different widthstripes. Trim the threads at each end. 3. 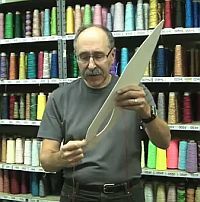 Using your 1/8" Treasure Trim, create atape border around the outside of the scrolled paper, overlapping the paper andthe ends of your thread stripes. Peel back the red liner and lay down a borderusing your 042 Ribbon. 4. Punch a "stamp" shape out of thepink cardstock. Next punch a smaller square shape out of your coordinatingpatterned paper. Attach it to the center of your stamp shape. Cut a small heartfrom your Treasure Tape sheet, and adhere it to the center of your square. Pressfirmly. 5. 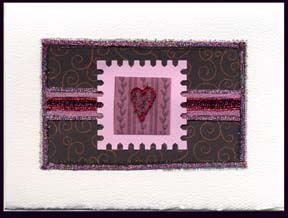 Adhere your stamped motif to the center ofyour card, over the stripes. Peel back the red liner on your heart shape.Outline your heart with braid. 6. 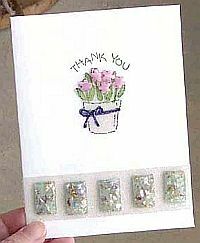 Place your card into a shallow tray or in asmall ziploc bag, and pour beadlets over the exposed tape areas. Tap to removeexcess beadlets. To print the instructions for this project click on the on the link above"Printable version" and then print the page using your web browser. If you have trouble printing this page and would like us to send you a printedcopy send a #10 SASE to: Beaded Pink Scroll Card, P.O. Box 1258, Parkersburg, WV26102. 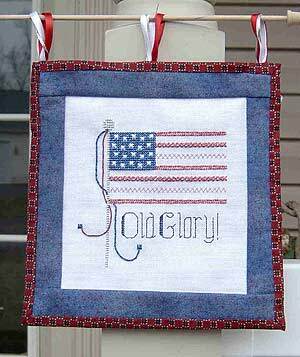 ©Copyright 2006 Kreinik. May be reproduced but not sold. 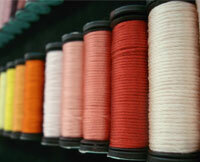 Consumer Info: 1-800-537-2166 or www.kreinik.com.Visit our web site for thread color charts, a store locator, and much more!